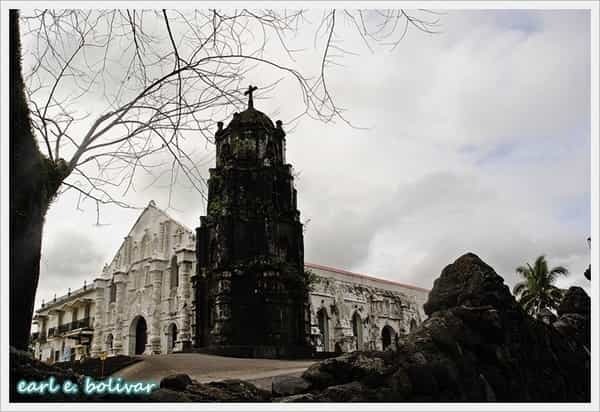 The Nuestra Señora de la Porteria (Our Lady of the Gate) Parish Church in Daraga, Albay is a National Cultural Treasure and is one of the most visited old churches in the Philippines. Also known as the Daraga Church, it was built in 1773 by Franciscan Missionaries on a hill overlooking the bustling town. When Mayon Volcano erupted on February 1, 1814, it destroyed the nearby town of Cagsawa, Budiao. Survivors of the catastrophe then chose to relocate in Daraga. Today, aside from its religious and historical significance, tourists flock to Daraga Church for another reason: it offers a majestic view of Mount Mayon. We failed to see Mayon's perfect shape at the peak of Ligñon Hill, so after breakfast, Malou and I set off to destination number 2: the Daraga Church. From the Legazpi Airport Hotel where we are billeted, we walked towards the highway and hailed a jeepney with Legazpi-Daraga signboard. Daraga is about 6 kilometers away from Legazpi City and I told the driver to drop us off near church's entrance. After about 15 minutes, we disembarked at the foot of Sta. Maria Hill which is only a few meters away from the back side of a Jollibee branch. From the main road, it was a short, uphill hike going to the church. The slope is quite steep though so it can be a bit tiring for those who are not used to walking. I was instantly impressed upon seeing Daraga Church for the very first time. The edifice made up mostly of volcanic stones stood like a sentinel overlooking the town. It's lime-coated facade is richly decorated with statues and carvings and has four distinctive spiral columns. Each of the four columns has a medallion in the center which featured carved images of the four evangelists: Matthew, Mark, Luke and John. I learned that the facade was coated with lime in recent years to prevent deterioration of the structure. The belfry beside the church, however, remained untouched. The belfry has an octagonal form and images of the twelve apostles are engraved on the sides of the six angles. Since the front doors are closed, Malou and I passed through the adjacent parish office entrance to get inside the church. Apart from the huge windows, the church's interior is much simpler when compared to other old churches I have been to. The ceilings are not decorated with art paintings and there are no elaborate ornaments in the altar. Before stepping back outside, we prayed and thanked God for our safe journey and for bringing us to this wonderful church. It was already high noon but still it was cloudy all over Albay. Mount Mayon is covered with even more clouds so, again, we failed to see its whole beauty. Despite this circumstance, my wife and I still felt blessed to have visited a National Treasure. Staring at it's impressively beautiful facade made me believe that the long travel we took was already worth it. But with plenty of time still left on our brief Albay stay, I have not lost hope that, somehow, somewhere, we will be able to see Mayon in her full glory. So after taking more shots of the church's facade, we went downhill and looked for a place to eat our lunch before heading out to destination number 3: Cagsawa Ruins. This pic would have been postcard-pretty if only Mount Mayon was not covered with clouds. 1. From Legazpi City, take the jeepney with Legazpi-Daraga signboard. Tell the driver to drop you near the entrance road going to Daraga Church. Distance from Legazpi City to Daraga is about 6 kilometers and fare is only 8 pesos. 2. The uphill road going to the church is quite steep. If you're not used to walking, you can hire a tricycle to take you directly to the church. 3. There are small sari-sari stores fronting the church where you can buy food and drinks. This is the fourth part of my Chasing Mount Mayon Series. This series chronicles our quest to see the perfect cone shape of Mayon Volcano. Follow this series to know if we were able to accomplish our elusive goal.